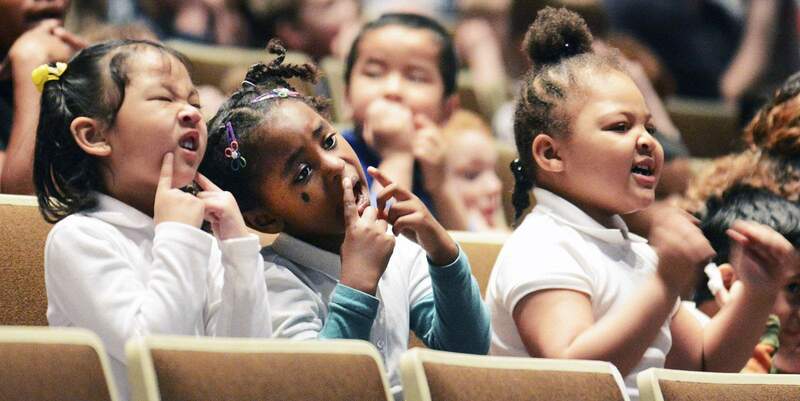 File: Harrison Hill pre-kindergarten students take part in a song at Arts United Center in April. INDIANAPOLIS – For once, GOP Gov. Mike Pence, Republican legislative leaders and Democratic Superintendent of Public Instruction Glenda Ritz all agree – Indiana should expand its foray into state-paid pre-kindergarten. But they disagree on the scope. And some lawmakers aren’t convinced about the overall effectiveness of the program. Pence had to burn a ton of political capital – and find $10 million in existing state dollars – in 2014 to get a pilot started. In its first year, the program served about 2,300 disadvantaged children in five counties, including Allen. The second year starts in August. But there is no data attached to the program yet to gauge its value. A full study tracking the children’s performance through third grade isn’t expected until 2020. Some studies have shown that disadvantaged children who attend pre-K arrive at kindergarten more academically and socially prepared than peers without preschool. But by third grade, test scores show no appreciable difference between those that went to preschool and those who didn’t. "I’ve been sold on its need," said Senate President Pro Tem David Long, R-Fort Wayne. "We need to bring more needy children into the program without blowing the budget. I think we proceed cautiously, but proceed." • Expand the existing, voluntary pilot for low-income 4-year-olds to all 92 counties. Providers can be public, private or faith-based. • Expand to only a handful of new counties that applied for the pilot in 2014 but weren’t chosen. • Alter the financial eligibility levels to allow more families in existing pilot and/or new counties to be eligible for aid. • The last – the Democratic choice – is to create a universal pre-K program for all 4-year-olds within every public school district. The program being pushed by Ritz and Democrat gubernatorial candidate John Gregg would cost the state about $144 million in its first year, but that would rise to about $288 million by 2020. And that assumes only 50 percent participation of 4-year-olds at $6,800 a child. "The cost issue is a very real factor for many," Pence said. "People don’t want to do this in a way that would jeopardize our commitment to K-12 or higher education in the state." Long was a bit less politically correct: "to just say universal pre-K without understanding the price tag is simply irresponsible." He said the legislature needs to assess where the greatest need is and start ramping up the program there. The 2016 annual report from the Indiana Early Learning Advisory Committee said that statewide, only about 13 percent of children in need of care are enrolled in a high-quality program. High-quality generally refers to providers that have received a Level 3 or Level 4 Paths to Quality certification. Allen County’s rate is at 34 percent. The lowest in the northeast Indiana region is Wells County at 0 percent, Adams at 3 percent and LaGrange at 6 percent. GOP House Speaker Brian Bosma said it isn’t feasible to expand to all counties because of the lack of infrastructure – there just aren’t providers available with open seats for children. He suggested maybe doubling the number of counties or students – some kind of significant multiplier of the program. But Bosma also cautioned that this is his own personal goal and is not on the House Republican caucus agenda – at least not yet. Bosma has been on the record for pre-K since at least 2012. Thirteen counties were finalists but weren’t chosen for the pilot, and they would be the obvious place to start with expanding. They are Bartholomew, Delaware, Elkhart, Grant, Howard, Kosciusko, Lawrence, Madison, Noble, St. Joseph, Tippecanoe, Vigo and Wayne counties. Rep. Dave Ober, R-Albion, isn’t really a fan of pre-K, but Noble County – which he represents – applied last time, so he is keeping an open mind. He voted against the program in 2014. "Right now we just don’t have the data. We have at most one year – we have nothing long term to show it’s working," Ober said. "My reticence from the beginning is ‘Does it work?’ and ‘Is there a return on investment?’ Some argue yes and some no." That specific question is why lawmakers added the longitudinal study when passing the pilot – to remove the questions. But Long said he is OK with cautiously expanding before having any solid data. Pence said early results – even if anecdotal – help make the case that the program is helping low-income children who aren’t being engaged in the home. And he plans to look at federal resources and corporate partners and ask the state legislature for more state money. But he has to get re-elected first. His opponent, Gregg, wants to go full bore with universal pre-K.
"Every business leader I have spoken to over the last few years has told me how important this investment is to not only our state but to our economy," he said. "We can work with our public schools and other high-quality providers to ramp up this program quickly and catch up with the rest of the nation. And, we can go after the federal dollars that Mike Pence turned down to help us grow even faster." There isn’t much talk about changing the financial eligibility, which is set at 127 percent of the federal poverty line or less. That is about $20,000 for a family of two and $30,000 for a family of four. An Indianapolis subset of the program dropped that to 185 percent of poverty, paid for by city funds. That program also covers 3-year-olds. No matter which way legislators go, Kevin Bain, chairman of the Early Learning Advisory Committee, said the key is making sure the infrastructure is in place. "Qualified teachers, seats, classrooms – that’s what we are focused on," he said. "To build capacity, you need funding. And it’s very hard to build capacity for a year and not know whether there is subsequent funding for future years." He suggested using a sliding scale on financial eligibility similar to the way vouchers are handled. The lower the income, the higher percentage of the grant amount would be covered. Bain also said that later this fall, the On My Way Pre-K program will release one year of data showing effectiveness.